I got back to this one and finally I can call it done. I decided to re-work a lot of it and take it all the way as a look dev piece. 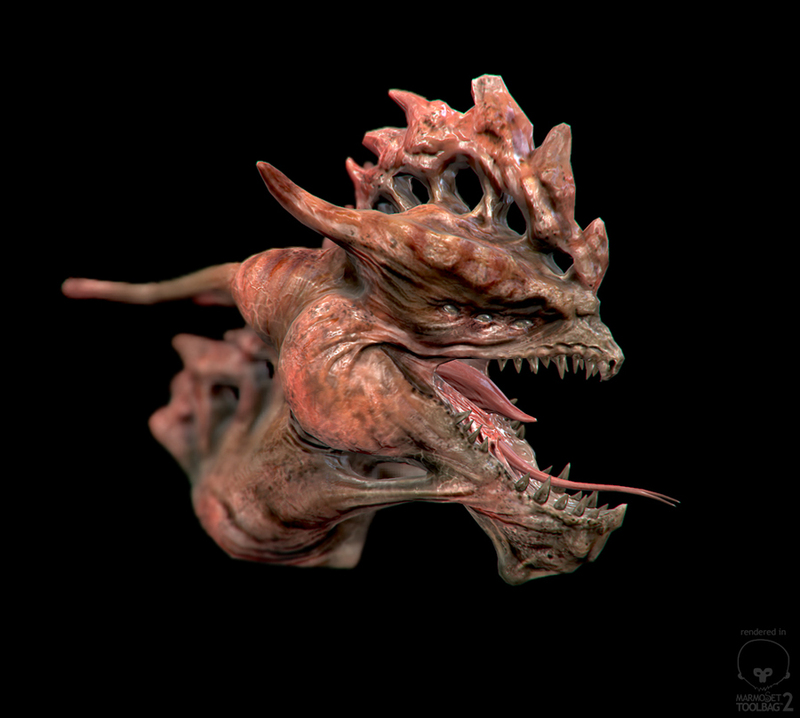 It’s being modeled and detailed in Zbrush, textured in Mari and rendered with Arnold. I have decided to post here few of my “back-burner” projects. Few characters that I have started and l left as blocked pieces, like this one. Making a full body Yokozuna Sumo Wrestler. In here just playing with lights and rendering in Keyshot. The anatomy, hair and clothing have a long way to go still. As usual, my posts take a long time in coming. It’s being more than a year and I have been sitting on this wip. I am hoping to finally get back on track and start finalizing some of my old wips. Next steps will be adding some arms and skin detailing. Started this one as a quick sketch. Just playing with meshes and brushes in Zbrush. Liking the way it’s going, but need to get back to my other “unfinished” projects. Want to have some more improvements soon. Over the holidays I worked on this one and just got some time to upload something. Yes!, it is still a WIP. I am still fixing and tweaking a bunch of things that I am not super happy with, but it’s getting there. Still playing a lot with the hair and the lighting, anyways, I’m hoping to be able to upload a “final” image soon. 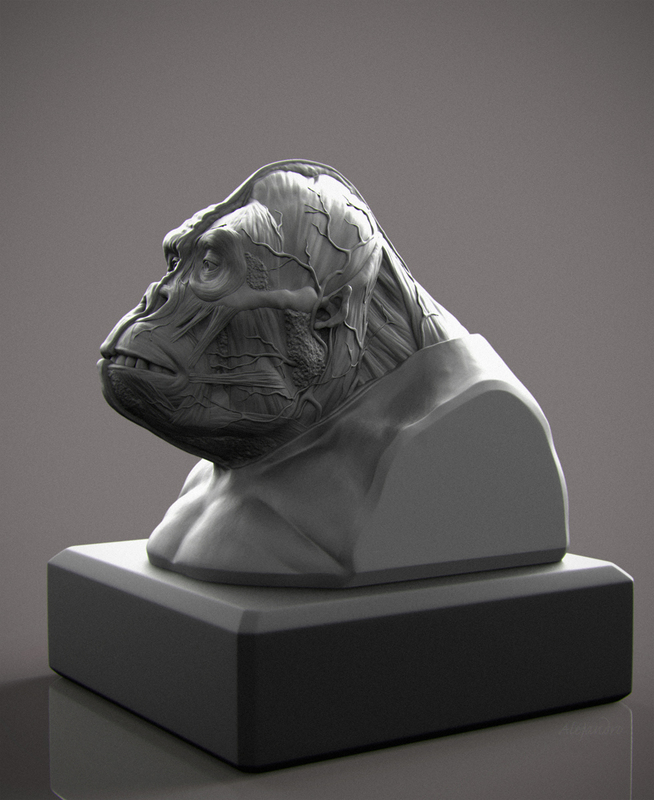 I’ve been working on a personal project with apes for a while now, having a blast and enjoying it a lot. I have been doing a ton of research on the gorilla and other primates, specially in physiognomy and locomotion (learning so much with all this). I detour a bit on the purpose of the main project, but I believe it worth to make this Ecorche bust study. It’s made in Zbrush and rendered in Keyshot. I hope you like it. I started this guy a long time ago during a Scott Eaton facial anatomy workshop in Toronto. Finally got some time to refine it a bit more. Just started working on a new project. Here are some views of a gorilla skull. Not super happy with a couple of things, but will get fixed eventually ;). It’s been a while since my main website is down. My site and server was hacked leaving me with no other choice but to rebuild the whole thing from scratch. I guess it was a good opportunity to clean some old stuff and share some new work. I will be making my main site live soon, so please bear with me. In the mean time, I have been taking a CG hair grooming workshop, trying to sharp up my skills making hair. The workshop has been very good so far, but, a bit though managing free and working time. Anyways, this is a test bear as part of a main assignment. Just playing here with XGen and some light rigs. Just started to play with Marmoset Toolbag 2 in my free time and decided to re-visit one of my super old projects and give it a try. So far I’m very impressed with the tool, simple to use and give great results. Honestly I can’t wait to put one of my newest projects in there.